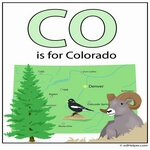 This section lists reading comprehensions on edHelper.com with references to the state of Colorado. These reading comprehensions were not written specifically for the state theme unit. His Name Was "Buffalo Bill"
Where Have the Honeybees Gone? Who Wanted to be the First Female Vice-President?